Thank you Teacher Chua. Beside sharing about Di Zhi Gui, he covered a lot of life philosophy. Thank you Dr Chen Jau Fei, World Renowned Nutritional Immunologist! She advocate preventive health science, prevention better than cure! 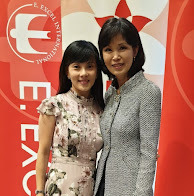 She is the founder of E Excel International which has almost 30 years of history. Her children are leading our eLead Global online business. Let's hear what her children said about her here.